The material is hard with a nice matte texture and a rubbery silicone lip around the edge to prevent moisture from seeping in. 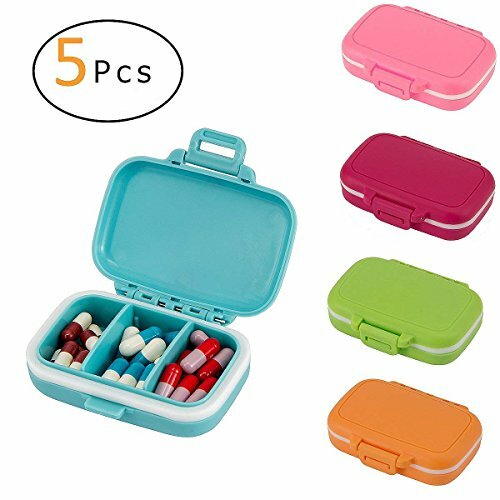 The dividers are removable, which is handy if you just have one specific medicine that you need, or if you want to use it to store larger pills. The size fits easily in your toiletries bag, purse or pocket. Note:The box is NOT compeletly waterproof and please wash it first before putting anything in it. Fantastic for traveling, especially for backpacking, camping, hiking, etc. And the size is perfect for purse or pocket. Secure closure and a rubber gasket design means your pills are safe to moisture resistant. Slightly raised lid allows pills to stick up slightly from the base compartment which is good for large or odd sized pills. The dividers are removable so the compartments can be changed in size to meet your demands. Note: the box is NOT compeletly waterproof and please wash it first before putting anything in it.